Any effective attack means the attacker must flow a burst of concentrated energy along a line directed at you. If the attack is a punch to the belly, the attacker's energy, embodied in his fist, moves along a line from his body to your belly. If it hits, you can be badly hurt. So you follow the first basic principle: you get off the line--you move or turn so that the energy of that punch does not connect with you. The second principle is to blend or harmonize with the attack. You practice Ai. . . . To truly harmonize with the attack, you would not only get off the line, you also would not slow the punch down or oppose it in any way. In fact, you might put your hand on the punching arm and add energy to it in the direction it was already going. You have harmonized and blended with the energy of the attack. By projecting your energy in the same direction the attacker projects his, you see, as it were, your attacker's point of view. . . . The third basic principle after you have gotten off the line and harmonized with your attacker's energy is to lead energy further than it originally intended to go, thus taking control of it. Then you can throw or otherwise control your attacker. The attacker thus provides most of the energy for handling his attack. 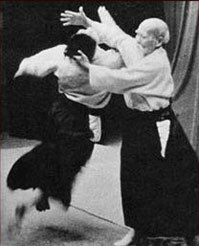 If you were a practitioner of Aikido, how would you react to a personal attack in this imperfect world? In an idealized scheme, we can distinguish three levels of self-defense. At the highest level of Aikido skill, you would have developed a great sensitivity to subtle cues from others. Among other things, Aikido is a kind of mindfulness meditation (Buddhist vipassana) in action. Thus you would probably sense that the other person was getting upset and might get physically aggressive, so you would leave before the potential attacker's feelings reached an overt level! Not being there when someone gets angry is a marvelously effective kind of self-defense, and you certainly don't need to get angry or aggressive yourself in practicing this approach. If you were not skilled enough to sense the imminance of the attack before your attacker felt angry, you would still be skilled enough to know how to stay centered and peaceful under the developing tension that precedes an attack. Remaining calm, present, and centered is an excellent form of self-defense. Note the importance of being present as well as calm and centered. You may be calm because you are so lost in your own fantasy world that you don't know what is happening around you, but that is quite different from being calm and present. As I have discussed elsewhere . . ., there is a great deal of fear of psychic abilities in many people, sometimes conscious, often unconscious. One way this fear can manifest without the person having to realize he is afraid, is through hostility toward psychic and spiritual subjects. Since I frequently lecture on these topics, I sometimes become the target of this kind of anger. I certainly don't like to be attacked for any reason, even if it's only verbal. I can become afraid, angry, self-righteous, and lose contact with reality as I get absorbed in this pattern. It's not only unpleasant, there is a further frustration: my goal was to communicate useful knowledge. I might seem to "win" an argument, but if I'm angry and self-righteous, I probably have not communicated effectively to my audience, and certainly not to my "opponent". Before I had studied Aikido, my reaction to an attack in a lecture question was to counterattack. I would expose logical flaws in my attacker's thinking, and/or show he was ignorant of the facts, and/or shower him with high-status scientific facts to demonstrate to him the error of his ways. I would usually "win" the argument, for I was an expert in the subject matter compared to almost all questioners, and a skilled debater. This also made me popular with most of the audience, who were typically "believers" in psychic and spiritual matters, for I had won a victory over the kind of person who attacked them, too. I fought force with greater force. In retrospect, I doubt that I actually communicated much of anything useful to my "opponent."